On the day he retires two things happen to Inspector Chopra. The first is that a young man is found dead, his death dismissed as an accident by Chopra's colleague. The second is a little more unusual - Chopra gets home to find he has inherited a baby elephant from his uncle. 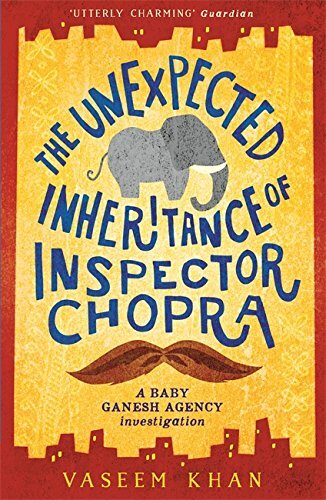 And so begins The Unexpected Inheritance of Inspector Chopra by Vaseem Khan. 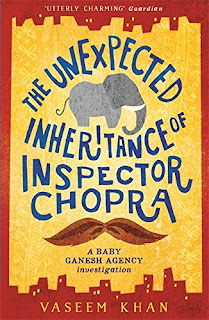 A lively, dark novel, The Unexpected Inheritance of Inspector Chopra is hugely fun to read and full of charm. At its centre is a murder mystery, with Chopra finding himself in more and more danger as he gets closer and closer to the truth. But it's not the crime element, as brilliantly executed as it is, that makes this novel such a joy. It's the way Khan explores what a man does with his life after the thing that takes up most of his time - work - is no longer taking up that time. Khan shows the fear Chopra has of going from respected police inspector to irrelevant old man, and he does it with humour as well as sympathy. Part of the humour comes, of course, from Chopra's relationship with the baby elephant - Ganesha. But Ganesha is no comic sidekick. Instead, the relationship between Chopra and Ganesha is touching, and the two teach each other things - the elephant teaches Chopra he is still needed and valuable, and Chopra shows Ganesha how to trust and love. It sounds strange to be talking about a man and an elephant, but the relationship is as strong as any detective and their human sidekick. There is plenty of other humour in the book, mostly from Chopra's wife, the fierce and intelligent Poppy, and her battles with neighbour Mrs Subraminium. I love that we laugh along with most of the characters, and not at them (apart from in the case of Mrs Subraminium). As well as humour, Poppy is also the person who brings a bittersweetness to the novel. Chopra and Poppy have no children, a point of sadness between the couple, who otherwise are deeply in love. Khan sensitively handles the plot point, without taking obvious or easy paths out. My favourite thing about The Unexpected Inheritance of Inspector Chopra is its setting. Taking place in Mumbai, we travel through the city with Chopra, and are caught up in the heat, the smells, the sounds. Khan's descriptions of Mumbai are beautifully done, and make you feel like you're right in the middle of the city. Mumbai, after Chopra, is the other protagonist in this book. Combining characters coming to terms with the passing of time, a compelling murder mystery, an unusual policing combo, and a fabulous setting, The Unexpected Inheritance of Inspector Chopra is an engaging, irresistible novel that ticks all the crime novel boxes you had, and ones you didn't know existed. How I got this book: From the publisher, Mulholland Books. This did not affect my review. I loved the book and your review! I also loved this book. I liked Chopra, Poppy, but especially Ganesha. The thought of Chopra taking a baby elephant around with him like a dog is totally unimaginable to me. Yet it works in India. Amazing!